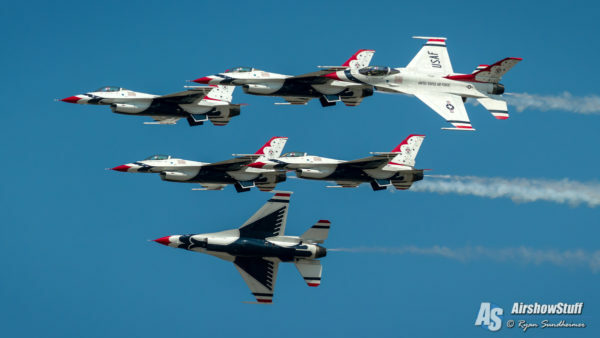 Looking forward to seeing the Thunderbirds at Willow Run this year! when will the thunderbirds come back to lake charles la. No Georgia dates this year???? Y’all need to recheck the schedule. Am hoping that this was overlooked. I need my Thunderbird fix. No dates in California? I want to shear the experience with my son’s. Plus I love seeing the show. Glad to see them returning to Langley . . . been toooo Long! will make the special trip “home” from SC to see them! Vandenberg AFB, a major USAF installation has been left out since 2000 and there are tons of T-Bird fans here in Central Coast, CA. Their last performance in 2000 was a record holder with approximately 25K+ in attendance. Is there a chance of adding them to the schedule in the future? Always a thrill to see, hear and experience our Air Force Thunderbirds. Am so looking forward to the Columbus Air Force Base spectacular! An event for my entire family. When will Thunderbird have an airshow at Maxwell Air Force in Montgomery, Alabama? I am Robert Dansby from Brundidge, Alabama and I am deaf. I met Thunderbird ‘s group in 2006 and 2017 at Maxwell Air Force in Montgomery, Alabama. When will air show in lake city Florida be again, loved it the last time. I’m looking forward too attending this year’s air show at March Air Reserve Field in Riverside California; I’ve always have been a very true loyal fan; of all air shows; but this is, very special for myself, and my entire family&friends too attend the air show here in Riverside California, because i thought the air show at March Reserve Air Force Station was cancelled awhile back, the last air show, i went too was back in 2012 at March Air Reserve Field; and after, i didn’t see anything in past years about the return of the air show in Riverside California!! So, As of next month’s air show, i will continue my ultimate favorite hobby attending the air shows at March Air Reserve Station in Riverside California!! I will be attending tne air shows from now on…. Thank you all so very much for continuing my ultimate fun&exciting hobby too attend the air shows; once again: I’m looking forward to attending this year’s, and the future air shows in Riverside…. No BAFB (Barksdale Air Force Base) air show this year, and I don’t see one for next year either. I am waiting to see you all! Its a real shame that they overlooked us here at Fox Field this year! Id bet my inheritance that im not the only 1 who DID NOT chk their schedule. I saw a young boy crying today because he’d just found out they were not here. Broke my heart .